We’d love your help. Let us know what’s wrong with this preview of Clovis Crawfish and Etienne Escargot by Mary Alice Fontenot. 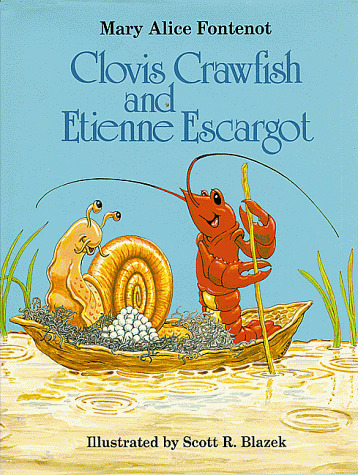 Originally published as a two-color edition in 1979, Clovis Crawfish and Etienne Escargot was an immediate hit with fans of the French-speaking animals of the bayou. This edition, with full color and black-and-white illustrations by Scott R. Blazek, brings the familiar characters to life. Rain falls steadily on the banks of the bayou, turning the dirt to mud and causing the Originally published as a two-color edition in 1979, Clovis Crawfish and Etienne Escargot was an immediate hit with fans of the French-speaking animals of the bayou. This edition, with full color and black-and-white illustrations by Scott R. Blazek, brings the familiar characters to life. Rain falls steadily on the banks of the bayou, turning the dirt to mud and causing the water to rise. But Etienne Escargot has barely noticed the rain-he has laid a mound of tiny, pearl-white eggs and is overwhelmed by his good fortune. Too late, he realizes he is marooned on a mud pile in a growing puddle. Can Clovis Crawfish think of some way to save the unborn snails? Will the fast-pecking Waldeaux Woodpecker be able to make a pirogue before the rain washes the eggs away? To ask other readers questions about Clovis Crawfish and Etienne Escargot, please sign up.